In the 1990s in Morocco gradual political reforms culminated in the constitutional reform of 1996, which created a new bicameral legislature with expanded, although still limited, powers. Although reportedly marred by irregularities, elections for the Chamber of Representatives were held in 1997. With the death of King Hassan II of Morocco in 1999, the more liberal-minded Crown Prince Sidi Mohammed, who assumed the title of Mohammed VI, took the throne. He has since enacted successive reforms to modernize Morocco, and the country has seen a marked improvement in its human rights record. One of the new king's first acts was to free some 8,000 political prisoners and reduce the sentences of another 30,000. He also established a commission to compensate families of missing political activists and others subjected to arbitrary detention. 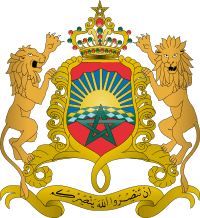 ↑ Morocco profile from the Library of Congress Country Studies project. This article is issued from Wikipedia - version of the 5/31/2010. The text is available under the Creative Commons Attribution/Share Alike but additional terms may apply for the media files.